Welcome to the BMW vehicle that can do it all! To begin with, the BMW 3 Series is one of the most highly awarded vehicles of all time. A lot of the praise given to the car is because of the blend of handling characteristics, practicality, features, technology, performance, and the overall fun factor gained from driving it. What makes this particular 3 Series special is the fact that it's a wagon. Not only is the wagon 3 series ten times rarer than the sedan, but it's also more practical. A lot of people think they need an SUV, but then they become saddened by the loss of performance that they had in their favorite sedan. 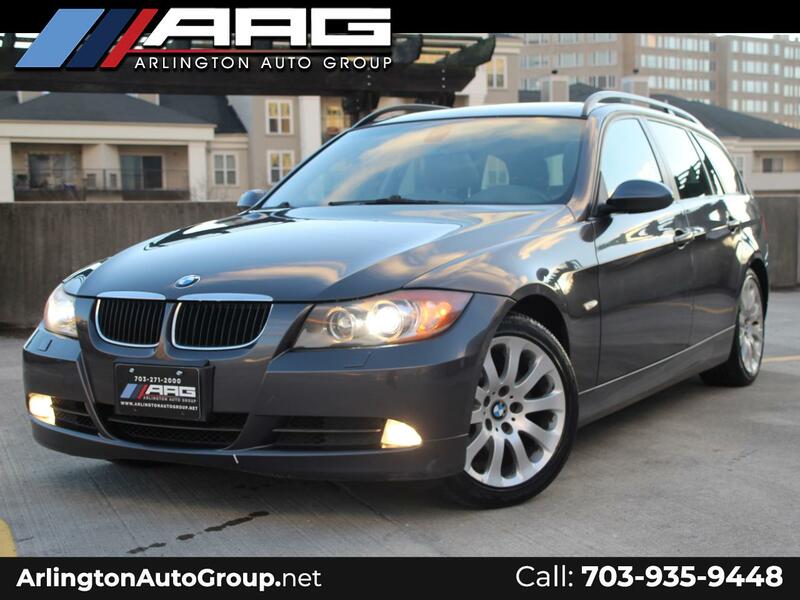 This 3 Series wagon is the perfect solution for someone who wants a car, but also wants space to car their family and perhaps a lot of luggage all at the same time. Making a perfect road trip vehicle, this car features a smooth and capable powertrain. What also makes this car a favorite amongst many is the inclusion of BMW's XDrive all-wheel-drive system, which makes this an equally dependable ride in harsh weather conditions such as snow or heavy rain. This car has strong body lines that are highlighted by the metallic nature of its gray exterior paint option. The hatch of this attractive wagon is accessorized by a high-mounted spoiler that pokes out above a bold and chiseled rear design. On the inside, the cabin is dressed with a highly respectable and fade-free gray leather interior that looks like it has never been taken away from the showroom floor. The overall fit and finish feels as high-quality as it should in a BMW vehicle. The dark woodgrain trim is appropriately placed in the car, as it contrasts the light environment of the interior. Making this an even more vibrant place to be is the addition of a full panoramic sunroof that spans from the front of the headliner all the way to the rear of the car. This is a certainly an inviting vehicle, with space available for adults in the front and the rear. Anyone will enjoy being a part of the ride, as there are features such as high-intensity discharge headlamps, steering-wheel mounted audio control, voice-controlled iDrive, bluetooth connectivity, power seats, a panoramic sunroof, rear folding seats, a shiftable six-speed automatic transmission, navigation, adjustable seat bolsters, lumbar support, and more. Driving this car will make you realize that it is just as fun as it is practical. The steering is tight enough to make corners a breeze, and the braking provides consistent performance that makes this a very inspiring ride on your favorite back roads. The sporty ten-spoke wheels are being turned by power supplied by a venerable 3.0 liter inline 6 engine that BMW is highly known for. Tailor the driving experience to your own experience by bumping the shift knob either forward or backwards to initiate up and downshifts, if needed, while driving this car. Exiting a pair of exhaust tips at the left side of the rear bumper, is the even sound of a smooth and progressive six cylinder exhaust note that need becomes overbearing while driving. We know that it will be easy for you to fall in love with this car and all of its capabilities once you get behind the wheel. At this point, the car is ready to be driven to your home! We've sent this car through a strict mechanical revision process, before being placed for sale. Drive this car, and you will be impressed by what it offers you in dependability and ride quality. Feel free to ask us about our extended warranty options, in case long-term ownership is a possibility. WE OFFER ADDITIONAL INCENTIVES FOR ACTVE DUTY AND RETIRED MILITARY PERSONNEL! When you are interested in reserving this car for yourself, or if you have any questions, please contact us at (571)260-3207 via call or text! Message: Thought you might be interested in this 2006 BMW 3 Series.